Andrew Neiman (Miles Teller) is an aspiring Jazz drummer who has been playing since he was a young boy. After being accepted into the prestigious Shaffer Conservatory Music College, he is recruited to join the band conducted by the infamous Terence Fletcher (J.K. Simmons). Whilst he is at first respectful towards Andrew, after their first full practice Fletcher subjects him to considerable emotional and physical abuse in front of the rest of the band. It soon becomes clear that Fletcher manipulates his students emotionally into furthering their talent, but in a way that could simultaneously ruin their life. Whiplash is a film that has crept by relatively unnoticed. To be perfectly honest, it only came to my attention pretty recently what with the award buzz that is surrounding this film. For that reason alone, I decided to go and view Whiplash, and that decision paid off. Whiplash is a monster piece of cinema, somehow capturing director Damien Chazelle's love for both the music and his characters. Dramas based on musical careers can be difficult to pull off and commonly wind up seen as a sports drama, just without the sports. But Chazelle has done something different here. Rather than just watching a "will he or won't he make it" journey, we stay relatively small. By bringing the scale right down, Chazelle gets to build his characters to extraordinary heights very early on. By the time the film reaches its final act, you will be speechless. When Fletcher begins emotionally abusing his students, we start to see how masterful Chazelle's script truly is. The insults we hear are horrific things for anyone to be subjected to, let alone from your teacher. But Chazelle allows a comedic undertone to guide these sequences, bolstered further by Simmons' delivery of these lines. Some of these insults may make us laugh, and we don't feel bad about laughing, but we simultaneously understand how horrific the circumstance is. I'm not yet entirely sure how Chazelle crafted this balance, but he's done it wonderfully. His script soars along at terrific pace, there is never a moment for breath. Once we're in, we're in, and we don't stop until the final drumbeat. Whiplash's title may not just be describing a song from the film and the effect these occurrences have on Andrew, but also how we feel when it's over. You may need a neck brace. 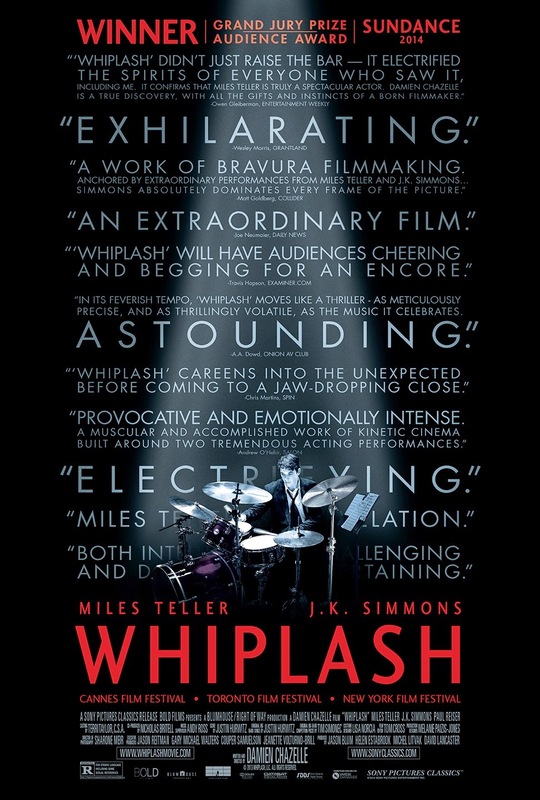 On top of all of this, though, Whiplash is also terrifically executed in terms of the film's technicalities. Whilst Andrew drums for his place in the band, Chazelle uses rapid cuts and swift camera work to intensify the scene; every drum solo feels as if it could be the last, leaving the film with a wicked sense of unpredictability. The film's final sequence, which I will refrain from discussing in case some readers haven't seen the film yet, is edited masterfully. Despite being filled to the brim with tension from the opening act, Chazelle somehow manages to save his best work until last. The final sequence is just sensational. But this film's crowning moment comes towards the end of the second act. It's a moment that has been done countless times in cinema, but here it hit harder than I've ever felt before. If you don't let out a small scream in despair, you probably aren't human. Whiplash is nothing short of a complete triumph. From the film's opening moments (in which the screen remains black as a drumbeat builds to a heart pounding crescendo), it is clear that the film won't let up. But somehow it just keeps building to heights you won't believe it could reach. Teller and Simmons are extraordinary; whilst the story never even shows signs of slowing, they consistently reinvest a sublime dose of energy to keep us interested in their characters. This film's true success lies with Chazelle, though, who keeps this film as visually stylish as it is emotionally available. Whiplash refuses to stop giving, and when it reaches its crescendo, you would be forgiven for cracking under the tension. It may be small in scale, but Whiplash more than makes up for it in every other aspect. Oh, and it might just put you off drumming for life, too. To Summarise: Dramatic, intense and darkly comic, Whiplash is an astounding showcase for Teller and Simmons' acting ability and Chazelle's superb storytelling.